Recommended to: Lovers of ARSON, as well as those looking for a dark, and intriguing read. More than three months have passed since Arson and Emery were taken. Taken and then separated. Salvation Asylum is more like a prison than a psychiatric facility. Unknowingly, Arson has become a vital instrument in a campaign set to genetically alter mankind. Enraged, confused, trapped, and unable to fully manifest his abilities, he wonders if he will ever see Emery again. His new existence is one crawling with questions. Is Grandma alive? Where does the fire come from? Can he become more than a monster? 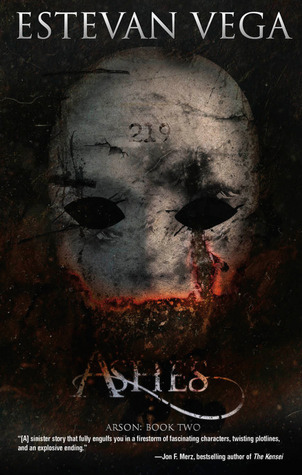 In Ashes, book two of the ARSON series, nightmare and reality collide as Arson must embrace what he is and the haunting realization that there may be others out there, others like him. Let me start out with a simple statement. I liked Arson, but I loved Ashes. Loved it so much that I devoured it from cover to cover in a matter of hours. To those of you who might have started on Arson Gable's journey, but haven't yet had a chance to dive into this book, hurry up and snag a copy! Once again the driving force of this book is the darkness that is inside people. Arson and Emery each battle the internal voices that are driving them mad. Bad. Good. The lines are so blurred now it's all in question. Estevan Vega has created a world that is equal parts inside these character's head, and inside the penitentiary like asylum that contains them. Ashes is a much darker read, and it delves much further into who these characters actually are. Arson and Emery are of course back in this sequel, but new characters make a debut too. There's Adam, a fellow prisoner and confidant. Then of course there are the captors, whose story is sinister to say the least. Finally, we get to see further into the enigma that is Emery's parents. Their story blends seamlessly in, as they hunt down the people who took their daughter. It also gives the reader a fabulous look at the guilt, the raw humanity, that is inside Emery's father. I think their story added a nice layer right on top of everything else. The POV changes multiple times in the story, to allow the reader to see through many eyes. Not to worry though. The changes are seamless and I thought that every character had a unique enough voice to make them easy to distinguish from one another. Pieces of the puzzle that make up Arson and Emery's story are slowly revealed, and there is just enough reference to the last book to keep a reader quickly refreshed and ready to dive back in. There is so much action in Ashes, but it is evenly paced so that you always get just enough to keep you reading until the next piece of the puzzle falls into place. Is Arson something more than he once thought? Does he have the power to be more than just a freak who makes fire? What is it about his past that he just can't seem to remember? You'll find out my friends. You'll find out. In a cruel twist, which I'm sure was entirely intentional, once again the story is open just enough at the end to allow Arson's story to continue on. In all honesty, I can't wait. Ashes is the perfect blend of all of my favorite things. Darkness, power, morality, love, and so much more. Trust me, if you haven't picked up this series yet and you have been debating it, do it now. Estevan Vega weaves a story that is well worth your time.